The Minnesota Council on Foundations is involved in a multi-year oral history project supported by funding from Minnesota’s Arts and Cultural Heritage Fund. Through a series of interviews by historians, the project will document the role and contributions of philanthropy in Minnesota between 1969 and 2013. The project will continue at least through 2016. It is sometimes said that you can’t change the past. But you can certainly learn from it to change the future. With that spirit, here are thoughts shared by grantmakers with years of knowledge and wisdom. These are their words – sometimes edited for clarity and conciseness – about three areas that continue to be discussed by grantmakers today. 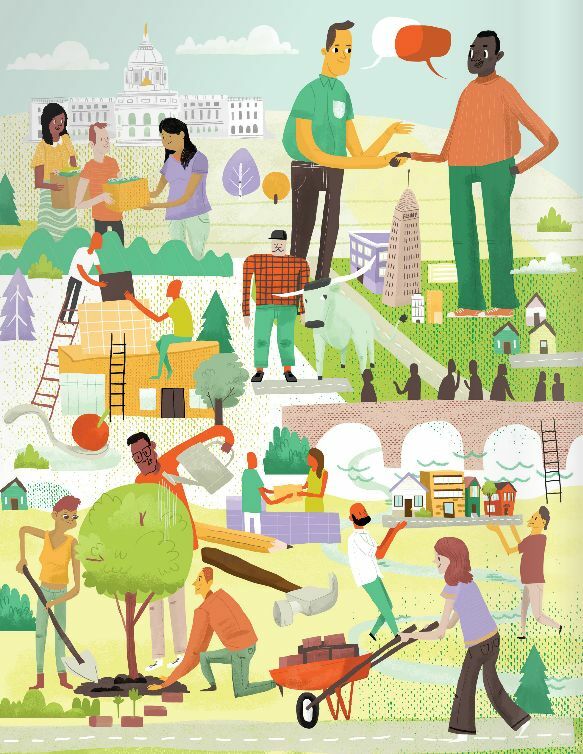 Interviewees were asked what they thought caused Minnesota’s elevated sense of community. Their answers reflect a deep belief in the greater good and a feeling of responsibility that reaches far beyond themselves and their families. Richard McFarland, long-time member of the Twin Cities financial and philanthropic communities, talked about how he got his start in nonprofit work. McFarland took on roles at Greater Twin Cities United Way and Junior Achievement and never looked back. Eventually he served as a trustee of Bush Foundation, Greater Twin Cities United Way, The McKnight Foundation, The Minneapolis Foundation, RBC Dain Rauscher Foundation and others. Along the way, he too began to advocate for the importance of community involvement. McFarland believes Minnesota businessman John S. Pillsbury captures the idea with this thought: No self-respecting citizen could neglect the needs of his community, any more than he could the needs of his family. Those with more gave more as a matter of course [and] democracy’s duties were to be shared by all. That is the very foundation of Minnesota greatness. Philanthropists also talked about the necessity of local people finding solutions to local problems and a belief in sticking around for the long haul. Cynthia Gehrig, president of The Jerome Foundation from 1976 to 2013, discussed how small changes over time ensured the board eventually reflected the community. “When I came to The Jerome Foundation, there were no women on the board,” she says. “First the fight was gender. Then the fight was race and then about the same time, the fight became class. You get this incremental change and you keep going. “Our nominating committee also asked staff to go into the field and get suggestions from our grantees of people they thought would be great board members – the kind of people that they would like to see reviewing their proposals,” adds Gehrig. There was also discussion about the necessity, then and now, of families, grantmakers and MCF to think boldly. In 1976 Bush Foundation hosted its first public meeting at the St. Paul YWCA auditorium. At the time, this was a groundbreaking strategy and definitely not a normal process for a foundation. “We outlined the foundation’s grantmaking, and invited questions and suggestions from the more than 400 people present,” says Humphrey Doermann, executive director, Bush Foundation, 1971 to 1997.